Gibraltar has long played an important role in history. 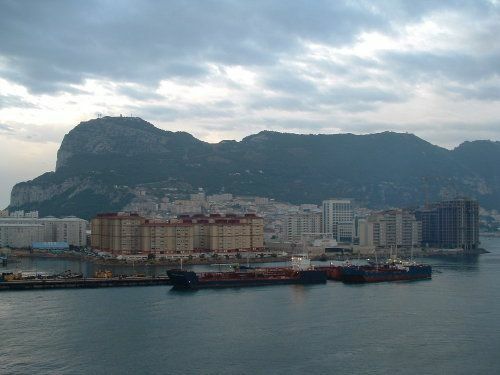 Its strategic position at the narrow entrance to the Mediterranean has made Gibraltar the envy of many invaders through the centuries who sought possession of the tiny peninsula with the big rock. Next door Spain ruled Gibraltar for over 242 years until it was transferred to Great Britain in 1713. Gibraltar has remained strongly British since that day. Many cruise ships call on Gibraltar for the day on cruises between the Mediterranean and northern Europe. With a day in port, visitors can visit the famous Rock of Gibraltar, tour St. Michael's Cave, and learn about the important role Gibraltar has played in the history of the world. We had a wonderful day in Gibraltar from the Crystal Symphony on a food and wine theme cruise from Barcelona to London. Join me on a tour of Gibraltar. The Rock of Gibraltar as seen from the Mediterranean Sea. This view of the "Rock" is not the familiar western one we see from the Prudential Insurance logo. Our shore excursion from the Crystal Symphony started with a cable car ride to the Top of the Rock. Great views such as this one can be seen from the top of the rock of Gibraltar. Note the Crystal Symphony at the dock in the center of the picture. Looking out over the Strait of Gibraltar from the top of the Rock. Note the ships in the narrow channel. That's Morocco far in the distance. The continents of Africa and Europe are only 14 miles apart at the Strait of Gibraltar. The Strait of Gibraltar with the Atlas Mountains seen in the distance. The Rock looms 1400 feet over the Mediterranean, and Africa is only 14 miles away. After we saw the exceptional view from the Top of the Rock, we followed this paved walking trail down the rock to St. Michael's Cave. We were in Gibraltar in May, which is the beginning of the season when the young Barbary apes (macaques) are born. Isn't this a sweet photo of mamma and baby? On the walk from the Top of the Rock of Gibraltar down to Michael's Cave, we passed by the Ape's Den, the place to always see Barbary apes. These Barbary apes at the Ape's Den on the Rock of Gibraltar certainly seem to love oranges! St. Michael's is a cathedral cave with a unique auditorium used for concerts and other cultural events. St. Michael's Cave inside the Rock of Gibraltar was once thought to be bottomless. In olden times, people thought that there was a subterranean passageway connecting Africa to Gibraltar. Sounds like something out of a mystery book doesn't it? The Gibraltar Airport runway crosses the narrow isthmus. Cars must cross the runway when driving from British Gibraltar to Spain on the other side. Look closely. You can see the jet going along the runway and a truck waiting to cross on the road. British Gibraltar has very little area, and the important airport runway takes up a major portion of land. To drive from Gibraltar to Spain, vehicles must cross the runway. The Great Siege Tunnels of the Rock of Gibraltar are an engineering marvel. These tunnels have helped protect Gibraltar since the late 1700's. The hike down into the Great Siege Tunnels is fairly easy since it is down hill. The hike back out is something else! The interesting historical perspective in the tunnels make the hike worth it. Everyone who visits Gibraltar wants to have their photo taken with one of the famous Barbary apes. This is really my mom and I with the ape in the middle. The legend says that if the monkeys disappear from Gibraltar, so will the British. If the closely monitored population of apes falls below 200, more monkeys are to be imported from Morocco. This fellow has a great place to watch all the tourists! Our guide estimated that little baby at its momma's breast was less than an hour old. This familiar view of the Rock of Gibraltar is from the west side, with the airport runway between the van we were in and the Rock.